The trend team should be making predictions. 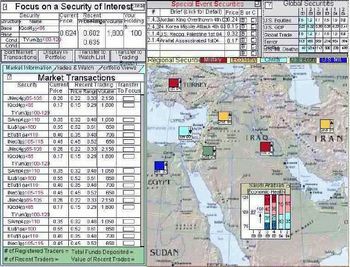 Which made me think that someone should be building a futures/prediction market exactly like the one that DARPA suggested for security experts. Or like Celebdaq. Because there are all sorts of useful data sources which people who claim to be trend experts ought to be willing to place predictive bets on. Sources like TGI, TRU, or Yankelovich. You could buy futures in the increases or decreases in agreement with statements like 'a real man can down 8 pints in a single sitting' or all those classic TGI statements. How hard could this be? Why aren't all the quant companies doing this? Surely they could tap into all sorts of Wisdom of Crowds predictive genius and sell it as a product. If only I was more entrepeneurial, I'd be doing it. And then you'd have a great, objective tool for measuring a Future Lab against a Future Factory. How much fun would that be? You'd have Trend Hedgers, Global Trend Trading, Slush Trends, Insider Trending. An Alternative Trend Market for emerging trends. TrenDaq. Brilliant. Or is all this already happening and I've just missed it? Hollywood Stock Exchange has been doing this for a while (since '97) with movies and celebs. It has become a huge source of market research for the film industry because the crowds are gerat at picking winners and losers (James Surowiecki proven right again). It would be great to see a similar site for brands - the results might be a more accurate way of measuring their value (plus being able to put your money weher your mouth was wold be kind of fun). Interesting idea, in a cultural sense.